You wouldn’t know it from my happy recap of the Santa Barbara Wine Country Half Marathon, but the race weekend started out as a comedy of errors. I keep thinking that the older I get, the more capable I will become. Instead, the older I get, the busier my life gets, and therefore the less capable I become! Evidence to follow…. My husband had gone out of town to celebrate his brother’s 40th birthday (as one does), and he planned to return at noon on Friday before the race on Saturday. He had already done a fair bit of work to get the travel trailer ready for us to camp for the weekend just outside the race location in Santa Ynez, but we still needed to pack, load up all the food, and attach the trailer to the car before we picked up the kids early from school and headed out of town. For any number of poorly controlled reasons, we left an hour later than planned, which meant that we hit rush hour traffic through Los Angeles at 3 p.m. on Friday afternoon. A drive that should have taken us 2.5 hours actually took 4.5 hours, and it became clear that I was not going to make packet pick-up for the race at Hotel Corque in Solvang by 7 p.m.
Now, please note that I am no race newbie. I’ve done about 21 other races. You would think that I know the importance of planning ahead and getting to packet pick-up on time. I take races super-seriously (too seriously?) and I recognize that picking up the bib and timing chip is top priority before a race. I’ve even done other races in Malibu and Santa Barbara where LA traffic was an issue for packet pick-up and I vowed to remember that. Still, I found myself stuck in LA in stop-and-go traffic, wondering if I could beg the race organizers to hand over my bib on race day morning. Thank goodness for a couple of non-runner friends who were traveling down from San Francisco to join us for camping for the weekend. I texted them a copy of my driver’s license and they agreed to stop in Solvang for me. They picked up my bib, timing chip and t-shirt, then strolled around town in search of a brownie (if only I’d been there to treat them to that brownie, or better yet, a bottle of Santa Barbara Wine Country wine!) We ended up meeting at the Cachuma Lake Recreation Area campground around 8 p.m., with me gratefully snatching the race bag and frantically pinning on my bib for the next morning’s race. But that’s not where the comedy of pre-race errors ends. I quickly realized that in my rush to pack before the race, I had forgotten, of all things, a running t-shirt and shorts. Yes, I am totally embarrassed to admit that. Who does that?! But see, I have an excuse (explanation?) On that Friday before the race, I’d run a shake-out mile. Just a single mile on the treadmill to loosen up my tight calves and assure myself I was ready for the race. I did that mile on my treadmill in my master bedroom. When I run on the treadmill in my master bedroom, I run in underwear and a sports bra, nothing else (sorry for that visual. Or, I suppose, you’re welcome). I mean, come on, who wants to do more laundry than necessary? So when I went to pack for the trip, I packed my running bra, undies, socks, shoes, and Garmin. What else do you need to run, really? Okay, fine, A RUNNING SHIRT AND SHORTS! Thank goodness my husband came to the rescue. He had some running shorts in his tennis bag. I paired that with the running shirt from the race (major faux pas to wear the shirt from the race before you’ve run it, but a girl’s gotta do what a girl’s gotta do), and I was good to go. This is quite possibly the least flattering running photo of me ever. Please keep in mind that it was 6:30 a.m. in 50-degree weather and I was wearing my husband’s running shorts, which make my waist look about three sizes bigger. I shouldn’t care but I do. The shorts turned out to be quite comfortable and I liked that I could use the pockets to hold the gel that I took around mile six (I had planned to wear my skimpy compression shorts and store the gel in my running bra). I’m not sure what the moral of this story is. All I know is that I’m grateful for my friends and my husband who supported me through the pre-race debacles (and my other friend who cooked up a delicious post-race omelet when I got back to the campground). 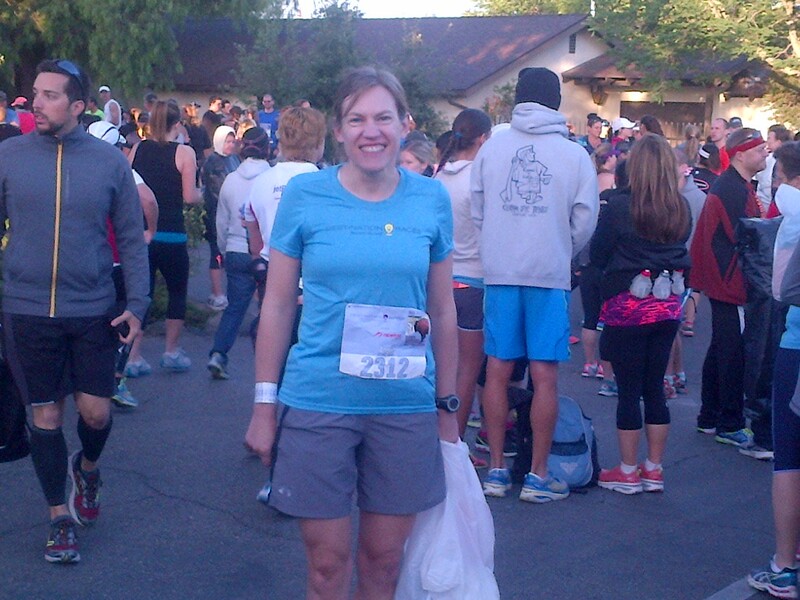 Have you ever missed packet pick-up or forgotten something for the race? This is my first time. I did talk to another friend yesterday who missed the OC Half Marathon race start by 40 minutes (mistaking the last race transportation bus time for the start time), but he was able to start the race 40 minutes late and have his chip time record his actual time! I love that you wore your husband’s shorts!!! And, hooray for friends to pick up your packet! Glad that it all worked out. Now, about the treadmill running, maybe I should try that on my treadmill:) Actually I already run in just my shorts and sports bra so I’m pretty much there!!! You went through a whole lot of stuff to get to that race! I am glad that it all turned out and it ended in you pulling off a fabulous race. Maybe your husbands shorts are your new PR shorts. I think you need to wear them for your next marathon lol! I’m just impressed that you were up for throwing *camping* into the mix! I can’t imagine trying to pack for that AND a goal race. I’ve never missed packet pickup, but I’ve developed a really bad habit of forgetting important gear, lately. The worst was driving all the way to Savannah, GA before realizing I forgot a race shirt AND bra. Lovely. Yes, I’m not sure what I was thinking with the camping/racing mix. I mean, I know I was thinking that it would be a nice way for my family to join me for the weekend, but it turned out to test my limits! Thank you for the shirt/bra confession — I feel better that I’m not the only one who blanks on the important race gear occasionally! I often see people running a race in the race shirt. It’s not a faux pas here in Ohio!